Don’t mistake a hand-assembled metal tea light holder for some Halloween-related accessory! The soft glow when massed together with candles ablaze certainly looks festive — and the holidays are here. These are serious pieces from lighting designer Tom Dixon’s Etch collection, first introduced at the 2010 Salone Del Mobile in Milan. 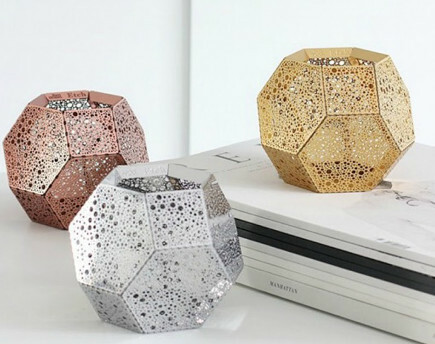 Produced in small numbers, each 5- x- 4 inch metal votive is crafted from etched .04 mm metal pieces digitally cut with an intricate pattern. Tom Dixon is a leading English metal accessories designer who began his career welding scraps of salvage metal into beautiful, usable pieces. Born in Tunisia, it’s not surprising to see pierced metal as a major theme in his work since that is a tradition in North Africa. 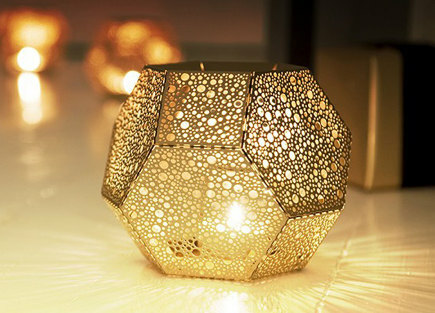 His Etch collection also includes pendant lights in the shape of geodesic (geometric faceted) globes. Small enough to be used in multiples on a dining table, or set around in a room, these votives offer a true alternative to candle holders or candelabra. They will also gain a welcome patina with use. Brass, stainless steel, copper and anodised aluminum are among the choices of metals. 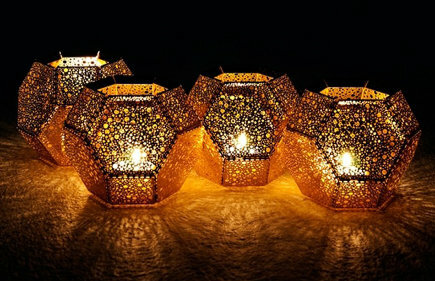 Tea lights and votives are rarely taken as seriously as lighting fixtures, but these should be. A pair or trio would make an amazing wedding gift for any modern design lover. Each piece is stamped with the collection and designer’s name so there is no mistaking the provenance. And, as we all know, metal accessories are durable enough to be passed down through generations of users. As I unload my traditional tableware and move to a more streamlined and contemporary table style, I find these votives so appealing. Several years ago, I bought a bag of 100 tea light candles on sale. Those are in the cabinet, waiting for these.